WHILE passing the reception desk at work this morning, I wondered who might be the recipient of this lovely gift (right). So it was an unexpected surprise when our chief receptionist Ros told me it was mine. The attached card simply said "congratulations councillor" and did not name the sender. So, my thanks to whoever it was, sincere thanks indeed. 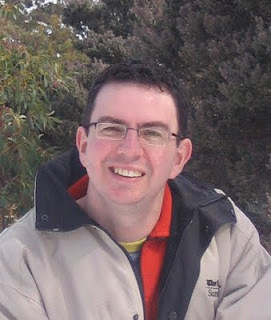 AFTER several attempts, our friend James "Migloo" Graham has at long last won a seat on the Derwent Valley Council. Councillor-elect Graham will bring an important new perspective to the council table and I look forward to working with him, and our new mayor and deputy, to bring about many of our common ideals. A QUICK note to thank all those friends who entrusted me with their number one vote in today's Derwent Valley Council election. I am humbled by the level of support, which at present appears more than sufficient to see me elected in second spot, just after Scott Shaw. 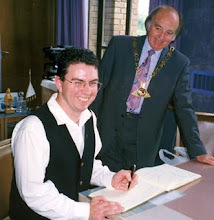 Scott was not successful in his attempt to be elected mayor, but he and I are equally excited by the boundless prospects ahead of us all, under the leadership team led by new mayor Martyn Evans and new deputy mayor Craig Farrell. There will be more to say in the days and weeks ahead, but for now, my sincere thanks once again. I will not let you down. 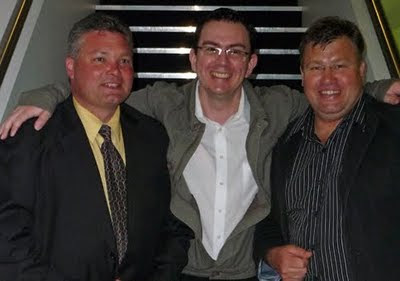 Martyn, Craig and I posed for this photo as we were leaving the tally room at Elwick an hour or so ago. WHILE the time has now passed for popping your council ballot papers into the post, there is still a chance to have your say by dropping your papers into the ballot box at the Derwent Valley Council Chambers in Circle St, New Norfolk by 10am tomorrow (Tuesday). At the time of writing, just over 55% of eligible voters have returned their voting slips by post. This puts the Derwent Valley in 9th place out of the 27 councils participating in the year's election, and just ahead of the state average of 49.75% participation in the election. I've saved my main theme for last. We need more information from the council. On all topics. The council must also become more transparent in its dealings. 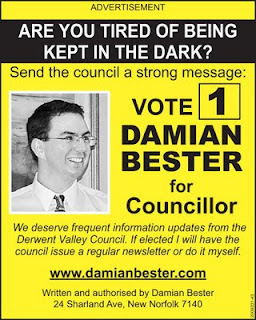 If elected I will have the council issue a regular newsletter, or do it myself. Climate change can't be ignored. It's the elephant in the room. I'm no expert on this topic, but the climate is changing. I don't know whether we caused it or if it's naturally occurring, but we can all contribute to a greener and healthier way of life. Our council could lead the way, reducing its power usage, buying greener vehicles and planting climate-friendly gardens. Who knows... maybe we could have a municipal wind farm or solar scheme. THE members of the recently-established Willow Court working party held a productive meeting this evening, well structured and kept in order by convener Graham McLean who even came equipped with a whistle to blow when I made too much noise on one occasion. It certainly stopped me in my tracks for a moment. The working party presented the outcomes of its first three meetings and provided a 24-page report at the end of the meeting. The group has made good progress in a short time, much more progress than the council has made in nine years. Its main recommendation is to proceed with security measures without delay. After a little encouragement, the council agreed to add this as a late agenda item at next week's council meeting. My only misgiving, which I expressed to the meeting, is that the working party has decided to meet in private and seems content to keep doing so. This is contrary to the spirit in which the working party was established. Several members of the group defended this decision and none expressed a contrary view. One member wanted to know why I had not volunteered to join the group if I was so interested in its workings. Once he permitted me to answer, I told the meeting the same thing I've told the other people who have asked the same question: Quite simply, my presence on the working party would hinder its progress while the council remains under its present administration. MANY thanks to those who put their names to a message of support in last week's Derwent Valley Gazette. I value your support and will send my personal thanks to each, in addition to this public acknowledgement. I have been overwhelmed by the many kind messages of support received, and I hope that I may be able to return the favour by providing you with effective representation on the council after the election results are known next week. THE town seems to be abuzz with scuttlebutt about the absence of the mayor from key events in the last week. A couple of our councillors attended the Federal Government's "community cabinet" at New Town on Tuesday night, but our mayor was nowhere to be seen. Given the council's fractured relationship with the Federal Government (people do get cranky when you sue them), it might have been an opportunity to mend some bridges and perhaps invite the Prime Minister to visit Willow Court. On Saturday morning there was no mayor at the unveiling of the municipality's first "Liberty Swing", a terrific initiative of the Variety Club, New Norfolk Lions Club and the Derwent Valley Council, to provide an opportunity for children in wheelchairs to experience the fun and recreation of having a swing. On Saturday afternoon, all candidates but one were assembled at the Lions Club to address an enthusiastic group of about 30 voters on topics relating to this month's election. The mayor had sent his apologies, as he had an extra-ordinary general meeting to attend. The organisers had extended an invitation to the mayor to call in at any time to address the voters, but by the time the event concluded at about 4pm, he had not arrived. The organisers of a function at the Bush Inn at 3pm on Saturday are said to have been more fortunate in winning the mayor's patronage. I cannot speak to this myself, as I was at the "meet the candidates" forum. NEARLY everyone I speak with asks me who I prefer for the office of mayor. I'm quite open with the fact that I could work happily and productively with any of the three challengers for the position. Sadly, the incumbent has made his attitude towards me quite clear at the last 12 or so council meetings. A question that should be asked of every mayoral candidate is: how much time are they prepared to dedicate to the role? The mayor of the Derwent Valley receives untied allowances totalling about $30,000 as well as reimbursement for phone calls, travel, etc. For $30,000 we deserve a mayor who is available to us all at the council chambers several days each week, on a scheduled basis. All this week I’ve been unsure about exactly what to say to you today. But just this morning, as I drove over pot-holed streets and dodged the giant planter boxes, it occurred to me that despite it all, I really do love this town. I love the valley that surrounds it. I love the drive to Strathgordon at the far end of our municipality. 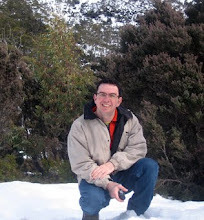 I love to visit Mt Field, and I love taking visitors to the snow at the top of the Lake Dobson Road. I love being able to do business where I know the shopkeepers and they know me. Our business people are not anonymous folk seeking to make a quick buck. They are local people like us, with a long-term commitment. They are Tony and Michelle, Susan and Graham, Leigh and Pauline, Joanne, Shane, Jill, Ray and Lesley, to name a few. I love our place in the nation’s history as one of the oldest settlements in Australia. I love knowing that Ikey Solomon and other convicts walked the same streets as I do. And I love the fact that we have Australia’s oldest hospital right here on this site, but that’s where the love affair ends. As a community we have been let down by our council. We have been embarrassed by our council, and the responsibility lies with some of my fellow candidates here today, as well as those who are not here. Developing Willow Court is not beyond the abilities of our community. But the council has not wanted the community to help. And what a mess the council has made on its own. Money has been lost, wasted and worse. I am ashamed of the state of our streets, roads and footpaths. We must rebuild our roads in the proper fashion, and not the lick and a promise they have received over the last decade. We must take pride in our town and rebuild our infrastructure so it matches the beauty of our natural surroundings. We must stop the removal of trees that enhance the natural beauty of our district, and we must plant more trees. Every day should be Clean-Up Australia Day in the Derwent Valley. Council vehicles travel the Lyell Highway every day, but for more than a week a mattress has been lying in a culvert near the motor yacht club. Give us the tools and we can all help keep our valley beautiful. As a journalist, I have an inbuilt hatred of secrecy. I am seeking election to the council in order to open it up. If elected I will encourage the council to issue a regular newsletter. If it does not, I will do it myself. I will also communicate via my own website and through advertisements in the Gazette that I will pay for myself. Many of you here today already know my story. 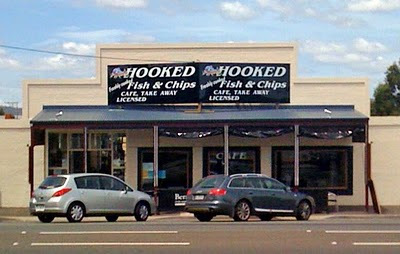 Some of you know me as the baby born at the New Norfolk Hospital; or the student of our local schools; or the member of Mrs Butterworth's drama club; or the keen watcher of movies at the Plaza Cinema; as the young customer of Hunter’s Shop, returning Coke bottles to raise 20c for a bag of mixed lollies; as the cub scout; as the St John Ambulance man; as the amateur historian; or as the writer of your story in the Gazette or the Mercury. You know that I am an honest person who will do my best to represent you on our council. I will not let you down and it will be my honour to be of service should you choose to elect me. I thank Ngaire Glover for her great initiative in organising this event and I thank you for listening. I believe from an article in the Gazette that the main motivation for the Burnett St pots was traffic calming rather than beautification. Granted they may be too high for the purpose, they should probably be round instead of square, and many people have a problem with the colour. Nevertheless I think you have overlooked the fact of the traffic calming objective, and the benefits to be had from traffic calming in Burnett St.
Traffic calming helps reduce the extent of hooning. I suspect it is because hoons don't like having to drive slowly and will pick another street. If they do this is a good thing for the pedestrian users of the street. The higher the pedestrian use, the more the benefit from traffic calming. Since New Norfolk has a proud history of hooning up and down High and Burnett Sts, I think traffic calming this is a good thing, to be applauded, explained and promoted by our civic leaders, not condemned because everybody else does. One final point - traffic calming devices take many forms. Road humps annoy people (they get the hump?! ), so widening the median strip and narrowing the road to one lane persuades drivers to slow down and drive more carefully, so the whole point of the devices is to make them large and to get in the way! THE Lyell Highway and Bridgewater Bridge have been big topics for many years now. The council has dropped the ball on the issue of a four-lane highway to Granton and gave its support to the recent (pointless) effort on the highway. When I asked about this, the council it admitted it had not asked about overtaking lanes until the roadworks had started. Not everyone agrees with the need for a dual highway, but at the very least we must resume the fight for more overtaking lanes. Meanwhile we are back where we started on the Bridgewater Bridge, despite the Federal Government once allocating more than $100 million for a new bridge. 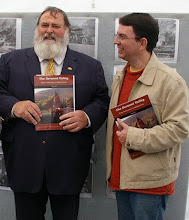 We must renew our efforts with vigor, to make sure we get the tallest bridge possible. The council has not been loud enough on this topic, and the bridge remains broken. Instead of suing the Federal Government over the council's own mistakes, it should pursue a co-operative approach for everyone's benefit. LAST week there was some suggestion that my family must have shares in the Derwent Valley Gazette, with me smiling happily from my bright yellow advertisement on the front page, and dad looking altogether too cheerful in the ad for Millingtons. 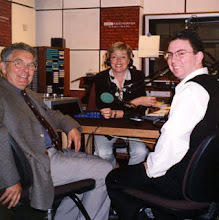 I can't speak for the funeral mob, but I'm certainly being charged full price for my election advertising - and they even wanted the money upfront, 20 years service to the company or not ;-) Anyhow, I can assure everyone that it's still the Murdoch family which owns the Gazette, and not the Besters. The Willow Court historic site has massive potential and could be developed, with due sensitivity, to the great benefit of both our history and our economy. The council must open Willow Court to visitors as soon as possible. The council frequently compares the site with Port Arthur, but has failed to learn the lessons of Port Arthur. Willow Court is at the same point Port Arthur was a few years after it closed in 1877. At that time all the famous buildings there were completely intact. It was neglect, vandalism and ignorance that turned them into ruins. We are going down the same road. Several members of the council have acknowledged that the money for Willow Court has been mismanaged. Some, quite notably, have not. One in particular has said he has not thoroughly inspected the books, despite $2 million being spent with no obvious result. The council has spent a fortune on expert advice but has not attended to basic matters such as electricity supply and site security. Precious historic items have been stolen or destroyed. The council must also explain why hundreds of thousands of dollars of Willow Court money has been used to fund Valley Vision. The way forward need not be complicated. Until funding is found for a big redevelopment, the council could provide basic visitor services on the site, produce a brochure, erect some information panels, and invite people to visit and perhaps enjoy a picnic on the lawn. 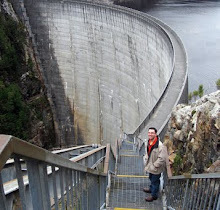 Isn’t that the way we used to visit Port Arthur, before it received its own multi-million dollar makeover? CONGRATULATIONS to Ngaire Glover for her initiative in organising the upcoming "Meet the Candidates" afternoon for this Saturday. I'll make a few brief remarks and then listen to what the other candidates have to say. I'm particularly looking forward to hearing what questions the public has to ask. The forum will start at 1pm, in the Lions Club rooms at Willow Court. Since the closure of the internal roads at Willow Court (which council could possibly have done that?) the only access to the Lions Club is via the George St entrance, opposite the RSL Club. Entry will be by gold coin donation to cover the venue hire. The name of each candidate will be drawn from a box to determine the order of speaking. Each candidate will have five minutes to speak, followed by five minutes for questions from the audience. Time limits will be maintained by the chairman, Geoff Dodge JP, retired general manager of the Brighton Council. Tea and coffee will be provided by the Lions Club. I understand all candidates but one will be there. ELECTION brochures are starting to land in local letterboxes, and many Derwent Valley residents will receive mine over the next few days. I decided not to litter the landscape with election posters, but I've put a bit of effort into producing a brochure which I hope will provide voters with a clear picture of what I'm standing for. For a bit of fun, I'm going to play "election brochure bingo", and I'll list each candidate's brochure here as they arrive at my home in New Norfolk. I've got several already, and I notice one of the mayoral candidates has issued his second flyer today. The Electoral Act prohibits me from naming candidates here without their permission, so I'll invent a nom-de-plume for each one. I'VE been asked about my position on those controversial planter boxes in Burnett St, New Norfolk, after my "declaration of war" in my advertisement on the front page of last week's Derwent Valley Gazette. Like many people, I have no problem with the concept of beautifying our streets. The idea of placing mature trees in pots was a good one, but something went wrong along the way. The expected circular pots ended up being the large pink pillboxes we are all now familiar with. The trees weren't quite as mature as some might have anticipated. As they stand, the planter boxes are a hazard to traffic and to pedestrian safety. Nearly all of the boxes have battle scars providing evidence of the poor execution of the original idea. Their placement was ill-considered as several of the boxes block the sight-lines of most motorists. The height of the boxes is another problem as they are just the right size to hide a child from view. The common-sense solution is to remove the boxes and replace them with the smaller, rounder, POTS we were expecting. The cost should be borne by those responsible for the current debarcle. In this age of recycling we might even be able to find a new use for those pink boxes. Perhaps they could be used for a sewerage plant at Westerway! 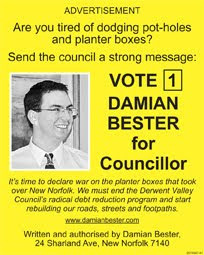 THOSE planter boxes in Burnett St, New Norfolk, have certainly been the talk of the town over the last year or so, which made them a good topic for my first election advertisement in the Derwent Valley Gazette today. 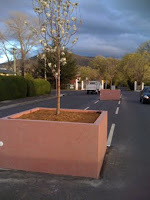 In many ways, the planter boxes are symbolic of the council's misplaced priorities. The expensive pink boxes are in stark contrast to the poorly maintained street itself. For a long time I've said that the role of councillors is to set policies and not worry about potholes, but the state of our roads, streets and footpaths is beyond a joke and now cannot be ignored. Whether I'm elected or not, the council must allocate a larger share of its budget to roadworks and it must explore all opportunities for state and federal funding, including low-interest loans if possible. Those councillors seeking re-election should explain what they have been doing while our roads have been going to ruin. 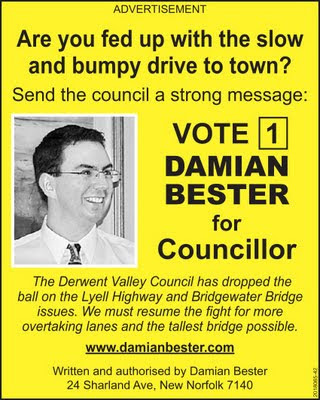 A QUICK post to acknowledge the messages of goodwill received since announcing my candidature for the Derwent Valley Council, in particular the offers of places for posters to be erected. I've long been of the opinion that election billboards are a blot on the landscape, so I will gratefully decline those offers. However, I have been told about a small poster seen in the window of a gold coloured Rover. Who could that be? Local council elections are conducted by postal ballot. Election material (including the ballot paper) mailed directly to each elector. This process is due to start on October 13 and every elector should have their ballot packs by October 16. All ballots are returned to the Tasmanian Electoral Commission in the post (as a postal vote) and must be received by 10am on October 27 in order to be counted. 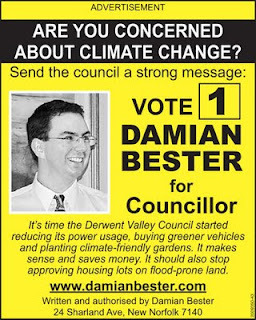 Thanks for visiting my campaign website for the 2009 Derwent Valley Council election. I'll be using this blog to let the community know a bit more about me; about some of my views on local issues; and to comment on matters relating to the municipal elections. 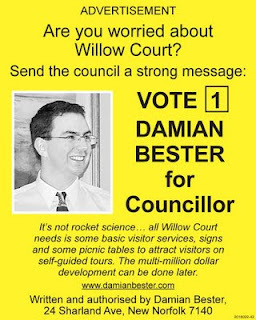 I welcome your comments, questions and feedback, and hope that you will decide to Vote 1 Damian Bester.